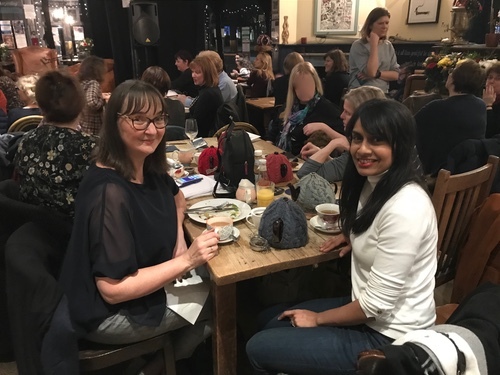 Earlier this week Words Away returned to the Tea House Theatre for the first in our series of salons for 2019. We were joined by literary agent Jenny Savill, a Director of Andrew Nurnberg Associates, to discuss How Agents and Writers Work Together. We covered much terrain, from the submission process to the creative challenges and rewards of maintaining an author’s career in the long term. Jenny worked as an actress in her twenties but, after taking time out to have family, began to look for other areas of work. She started at Andrew Nurnberg Associates (ANA) as part time PA to the managing director. She found the work really interesting and over a period of five years with Andrew Nurnberg as her mentor learned the agenting business. She’s now been with the agency for just over sixteen years and runs a successful list of authors, many of them award winning, placing books in the UK & US markets. She represents children’s and young adult fiction; also literary fiction, commercial and literary women’s fiction, psychological suspense, historical fiction, comic fiction, and narrative non-fiction. 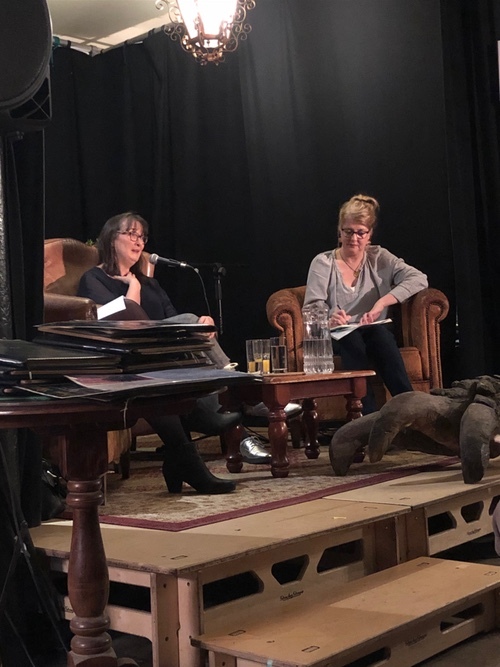 Jenny Savill sharing her agenting wisdom- with me taking notes and ignoring the giant claw by my feet. No prospective authors were eaten during the course of this salon. The author’s job, Jenny stressed, is to stay focused on the job of writing. A large part of the agent’s role is to manage an author’s expectations with a mixture of realism and encouragement. It’s important when taking on a new client that Jenny and her author share the same vision for the book and she works editorially with her new authors a fair bit to begin with, to get the book in shape. The process varies but generally once both agree that they share an understanding about the book, Jenny will send an editorial letter to the author. If they both agree on that, she might next work on the book with the client chapter by chapter, followed by line edits and so on until the book is ready to sell. With second novels, Jenny might discuss the concept at proposal level or after a first draft. She tends to be less involved as the writer’s career progresses, with the writer building a relationship with an editor. ANA is an agency that specialises in foreign rights, with offices in London, Eastern Europe, Russia, China and Taiwan. Rights such as translation, film, TV, audio and more can provide a vital income stream to authors. Rights can be sold separately in different territories across the globe and different markets may have different tastes, for example, crime novels do well in France, and graphic novels are popular in South America. An agent’s year is punctuated by trade book fairs, like the London Book Fair in March, the Bologna Children’s Book Fair in April and the Frankfurt Book Fair in October. With this in mind there’s not necessarily a ‘good time’ to submit a book. Jenny receives hundreds of submissions a year and takes on very few clients, as few as one to five annually. What does Jenny like in an author? A professional and focused attitude and approach to what is essentially a business relationship. Someone who listens to feedback, but who can also defend their choices. Someone who she can talk and laugh with. An audience member asked if it’s important for an emerging author to have a presence on social media? For Jenny it’s all about the words on the page. Social media platforms such as blogs don’t necessarily sell books. If it’s not something that comes naturally - don’t feel you have to use Twitter or Facebook etc. Focus on your writing. Writing that is not ready or that is overwritten is the most common reason for Jenny to reject a submission. Leave space for the reader to engage. To illustrate this point, Jenny referenced a recent BBC4 TV documentary, On Drums, and a conversation between musicians, Stewart Copeland and Sheila E: “…the space in between patterns is the most important part of rhythm…” and, “…the discipline is when not to play…”. Jenny suggested that this advice can be applied to writing too. It’s all about balance. Emma added, “the spaces in between are conditioned by the words around its edges”. Less is more. Jenny is committed to her clients and takes them on for the long term. However, in the unlikely event that she’s continually unable to place an author’s work then perhaps it might be time to consider parting ways. Notes on a submission letter: keep it brief: one page - not too long. Tell the agent about the book. Give the word count, genre, a blurb (the paragraph on the back cover) and a little bit about you. Check your spelling. Don’t stress about the synopsis. It’s a document to tell the agent what happens in the story. If you are having problems, try this: write the numbers one to ten down the left hand side of the page. Number one is the first thing that happens in your story and ten will be the end - write down the other big events in chronological order in between. What are the Questions an author should ask a prospective agent? What’s your approach when you take on a manuscript? Do you provide editorial help? Where do you see my book sitting in the market? What’s my book like (in relation to other books/genres)? Where might you submit? What editors would you send it to? Questions about rights - where would you try and place it? How might the - project do in the US or foreign markets? What will you do about film/tv rights? What are your rates of commission? Remember to grill the agent. Make sure you meet them. If you forget to ask anything, follow it up with an email until you are sure your vision is the same. Do your online research when it comes to agents. Look at who represents the writers you like to read. It’s a subjective business. Jenny sometimes turns away stuff that gets published and goes on to make money. With thanks to Jenny for her frank but encouraging insight into the agent-author dynamic. Our audience had a multitude of questions and Jenny kindly stayed on after the talk to have a few words individually with a number of writers. Next month, on 11th Feb, we’ll be meeting novelist and playwright, Alice Jolly at the Tea House Theatre Cafe to talk about Recovering Voices and Stories Lost From History. Places are still available for our 30th March masterclass: Crafting Your Prose: A Masterclass on Literary Style, led by Andrew Wille at the London Bridge Hive. I hope to see see you soon!